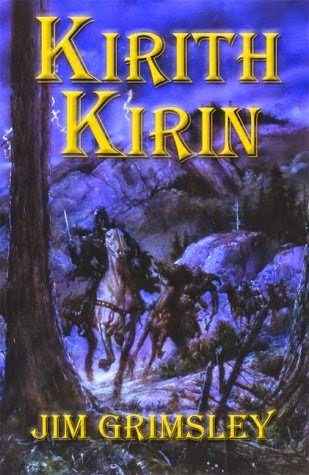 Kirith Kirin is like no other fantasy that you have ever read. Jim Grimsley has created a fantasy that could have come right from our world where power and greed can tempt, and sometimes conquer, even the most rightist person and where knowing who your friends and enemies are can be very difficult if not impossible. Yet it is not our world. For in Kirith Kirin's world magic is real, immortals walk the land, and people are sometimes the playthings for the dark arts. The Blue Queen, upon resuming the throne while King Kirith Kirin's eternality is renewed in the Arthen forest, has partnered with a magician of the dark arts. No longer does she need to leave the throne to renew her eternal nature. Swayed by promises of the dark magician, she has claimed the throne forever and is extending her influence to the far corners of the world. Malleable grey clouds, sidewinding wind, and intelligent lightning bolts made the trip across the vast Girdle nearly impossible. Out of nowhere, the Blue Queen's Patrols made haste to kill the boy and the warrior before they could safely reach the deep forest of Arthen. Riding upon two magnificent stallions, one a royal Prince out of Queen Mnemarra, Jessex and his uncle Sivisal reached Arthen despite a deadly storm that reeked of magic. Thus begins Jessex's new life as he enters Arthen and moves into the royal court of Kirith Kirin. Jim Grimsley does not fast forward any event in this incredible high fantasy novel. Grimsley is not a fantasy writer, he usually writes realistic fiction and stage plays. He is well known for his book Dream Boy. So it seems unfair and almost criminal that he should sweep in a write one of the best fantasy novels I have ever read. Kirith Kirin tells us a tale about a young Farmboy who becomes the most powerful wizard in the world whose destiny is to restore Kirith Kirin place as King, after the rule of the Blue Queen. Jessex is a marvellous narrator, wry and gentle and unexpectedly funny. Kirith Kirin is adorable too, even if everyone tends to treat him more like an errant schoolboy than an immortal king. The descriptive passages are atmospheric and gorgeous, and bring his marvellously vast and detailed world to life. But where Grimsley really shines is in the treatment of the relationship between Jessex and Kirith Kirin; this is one of the very, very few books that manages to keep it just as fascinating after reading as it was before. Their story is a painful one, which will keep you at the edge of your seat. I and am glad that I took my time in consuming this beautiful tale, so that I could appriciate the world building that Jim Grimsley has painstakingly thought about. I cannot recommend it enough. I am so glad that I went to the great length of purchasing this book in paperback, which is now out of print. I feel that I need to re-read this novel as the world that Grimsley creates is complex and I would recommend people to read the glossary before starting the novel this really helped me understand the book on a deeper level.